I’ve mentioned before that I am a big fan of leafy greens. Big, big fan. A taste for greens kind of comes with the territory when you grow up in the south, along with a decent addiction to fried okra and sweet tea. But unlike those two childhood favorites, greens can be an incredibly healthy addition to your diet - full of fiber, vitamins A, C and K, folate, iron and calcium - as long as you leave out the bacon that is standard in most southern dishes. And when you eat greens as often as Brian and I do you really should leave out the bacon. Or run a few extra miles a day which, lets be honest, could be worth it. We planted kale our first year with the garden but had very little luck with it. We were late getting the seeds in the ground that spring and wound up having very hot weather very early in the season so the poor little shoots never really had a chance. 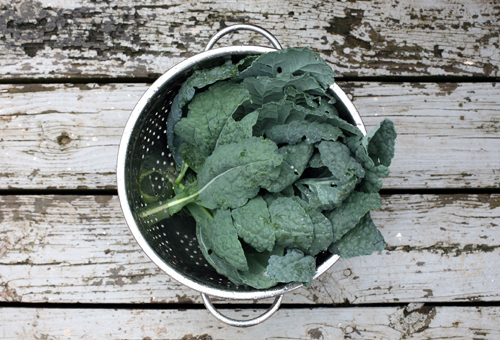 The next year we tried collard greens, having heard that they were a bit heartier than kale. Wow. Heartier was right. We had more collards than Brian and I plus the handful of friends that also like greens could handle. They were enjoyed immensely through most of the summer, but at the end of the season Brian not-so-subtly hinted that he’d had enough collards to last him for quite some time, and could we maybe try kale again next year? We chose lacinato kale this spring, also known as black or dinosaur kale, because we love its deep earthy flavor and feel that it is a tad less bitter than other kale varieties. The seeds went into the ground in mid-march, and because we’ve had a relatively cool and wet summer we've been enjoying a steady harvest of fresh garden kale for the last two months. The weather is getting warmer now though, and the greens are fading fast. I’m suddenly feeling the pressure to increase our intake before they all wilt away and we have to wait for the cooler fall air for our next crop. Luckily, this increase in consumption corresponded with a couple of key events that led to the creation of a new favorite salad. The first was an email I received a few weeks ago asking if I would like to participate in a Barhyte Foods recipe contest featuring their line of condiments - Saucy Mama. The second was my discovery that young, raw lacinato kale leaves make for quite the tasty salad. Accompanied by sweet roasted vegetables, tangy goat cheese and a delightful raspberry vinaigrette, the slight bitterness of the greens (which is typically tempered by blanching) was balanced perfectly. 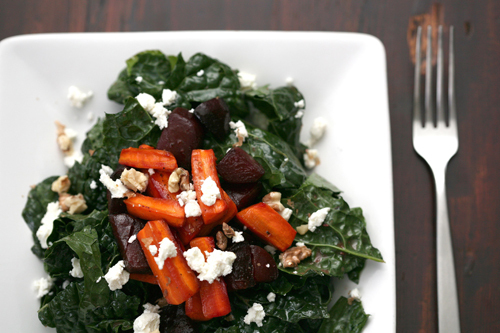 And because kale is more firm than lettuce it holds its own quite well even after being coated with the dressing, adding a nice crunch to a bite filled with soft beets and creamy cheese. 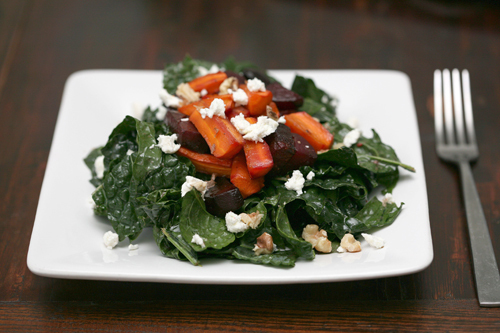 Add some toasted walnuts to the top and you have a lovely dinner salad in front of you. You won’t even miss the bacon. 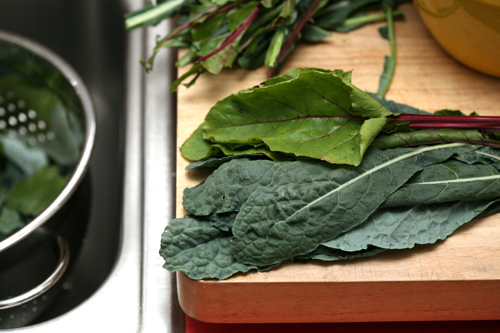 It is best to use young kale leaves, just 4 to 6 inches long and 2 to 3 inches wide. They will be more tender, and less bitter, than their older siblings. I also tossed in some beet greens, which have a wonderful spicy bite to them and are best if used within one day of being pulled from the ground. For the dressing I used Saucy Mama’s Raspberry Vinaigrette. In full disclosure, Barhyte Foods has sent me samples of their most popular condiments to develop recipes for a contest they are holding. Also, to be completely honest, I must tell you that this dressing is delicious. Really, really delicious.